The Principle of Open Space recommends that more open space should exist in the north, east or northeast than in the south, west or southwest. Even if it is only greater by a few feet or inches, it is still acceptable. The Principle of Open Space is related to the Principle of Height and Weight. Both of these principles protect the divine energy of the northeast. For a property, open space refers to the distance between the house (or main buildings) and the property boundary. More open space in one direction will increase the influences of that direction. Following are two examples of open space created by the building placement on the property. Benefits: Very Auspicious. 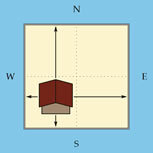 A building placed in the southwest quadrant of a property creates height and weight in the southwest and more open space in the north, east and northeast. Brings success, prosperity, commanding ability, happiness and good fortune. Results: Very Dangerous. 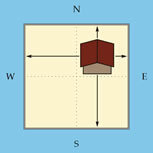 A building located in the northeast quadrant of a property creates height and weight in the northeast and more open space to the south, west and southwest. It is a life risk. Brings accidents, illnesses, perpetual money struggles, business failure, depression and no spiritual success. Your life will be miserable.